What Are the Various Kinds of Life Insurance? 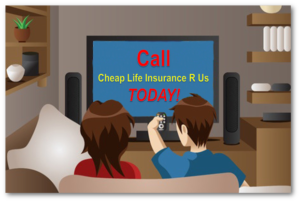 If you judge by the ads you see on TV for “Grab a Quote” or “Cheap Insurance R Us,” the only differences between life insurance policies for a given individual are the amount of coverage, the cost, and how long you want the policy to last. So why not just pick the cheapest policy and be done with it? The companies selling insurance based on price desperately want you to think life insurance is a commodity—that the only difference between their insurance and someone else’s insurance is price—and theirs is cheapest. The fact is that there are different types of life insurance, intended for different purposes. You’ll have the best coverage when you match the type of insurance with the job you want it to do. Term insurance is also the least expensive—at least in the short run—because it pays out only if the policyholder’s death occurs during the “term” of the policy. Renewing a term policy at the end of the term is more expensive—sometimes several hundred percent more expensive. That’s why it may only be less expensive in the short run. But term insurance is ideal for covering short-term needs. Term insurance is sometimes called “pure” life insurance, because the only the thing the insurance company offers is a death benefit—if the insured dies during the term. The three most common types of permanent life insurance are whole life, universal life, and variable life. Insurance companies may offer various hybrid policies, such as universal whole life, variable whole life, and variable universal life. But for now, we’ll stick to the basics: whole life, universal life, and variable life. They’re designed to provide coverage for your entire life. In other words, permanent coverage. Hence the name. As long as the premium gets paid, the coverage lasts until the bitter end—your bitter end. In addition to a death benefit—a legacy—these policies offer living benefits, which are all related to cash value—the internal buildup of money within the policy that you have access to, as the policy owner. How the growth of the cash value is calculated. What guarantees the company offers. Whole life policies accumulate cash value based on a formula predetermined by the insurance company. Once the policy is issued, the formula is guaranteed not to change. Thus, the cash value of a whole life policy will grow at a predictable and guaranteed rate, unless the policy owner does something to change it, such as surrendering the policy, withdrawing part of the cash value, or, in some cases, borrowing against it. Regular universal life policies accumulate cash value based on current interest rates. The operative word is “current.” What was current when the policy was issued may not be current several years later. Thus, there are no guarantees, absent the purchase (for a price) of a special “rider” that provides some nominal guarantees. Variable life policies promise you the possibility of accumulating cash value based on allocating a portion of your premium dollars to various instruments and investment funds within the insurance company’s portfolio such as stocks, bonds, equity funds, money market funds, and bond funds. Because of investment risks, variable policies are considered securities contracts and are regulated under the federal securities laws. Check out this article for a fair and unbiased comparison of universal life insurance versus whole life insurance, written by an executive at a top life insurance company that sells both whole life insurance and universal life insurance. This is someone who has no vested interest in either one. For questions to ask before choosing a life insurance policy, see the Life Insurance Guide article, How to Choose a Life Insurance Policy. 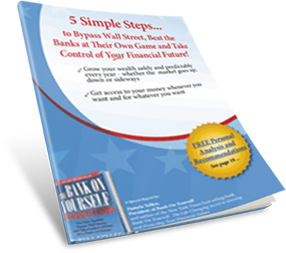 To find out more about the advantages of supercharged dividend-paying whole policies, grab your free copy of our Special Report, Five Simple Steps to Bypass Wall Street, Beat the Banks at their Own Game, and Take Control of Your Financial Future. For specific advice and suggestions tailored to your personal situation, request a complimentary analysis from a Bank On Yourself Authorized Advisor. Your advisor will review your circumstances and prepare a Personalized Solution for your consideration. There is no cost and no obligation. Request your analysis and get a referral to an Authorized Advisor here.